On the pav spread some mint chutney and then sprinkle the dry garlic chutney generously. 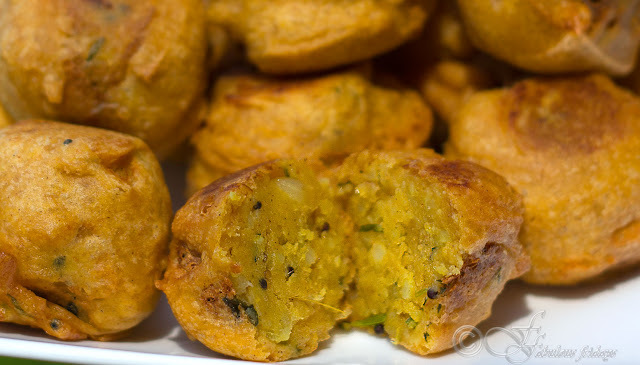 Top with a hot batata vada and serve with crunchy red onion slivers and long fried green chilies. Bet you can't eat just one. 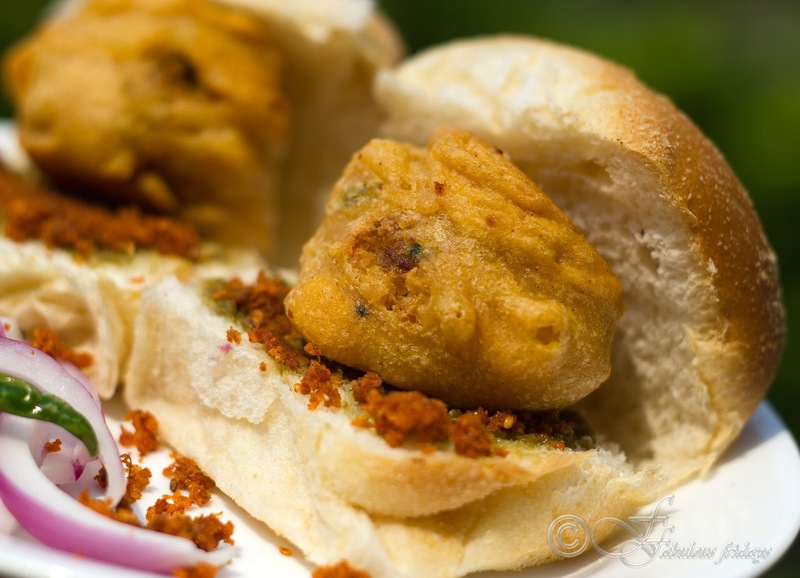 This delicious hot and spicy dry textured chutney is a must have condiment with Vada pav. Also called as the vada pav chutney, it has the unique nutty flavor from peanuts and sesame seeds, sweetness from tamarind and spiciness from the chilies. Make sure to use 2 types of chilies- one for the bright red color and another for the fiery heat. Gently dry roast peanuts and sesame seeds till they impart a slight aroma. Cool. Take all the ingredients in a grinder and coarsely grind everything together. Do not make a smooth paste, keep it coarse and textured. 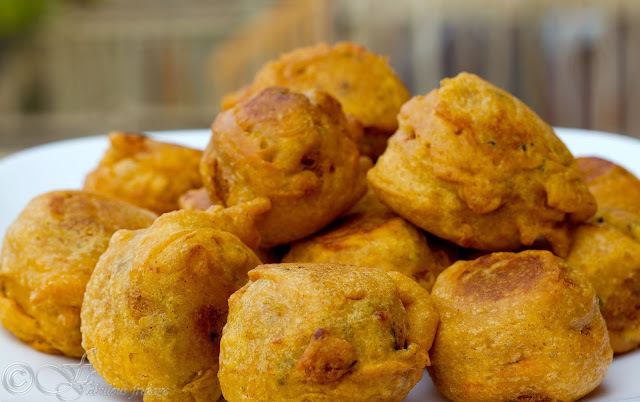 Bonda or Batata Vada are battered, deep fried potato fritters typically served as a tea time snack. 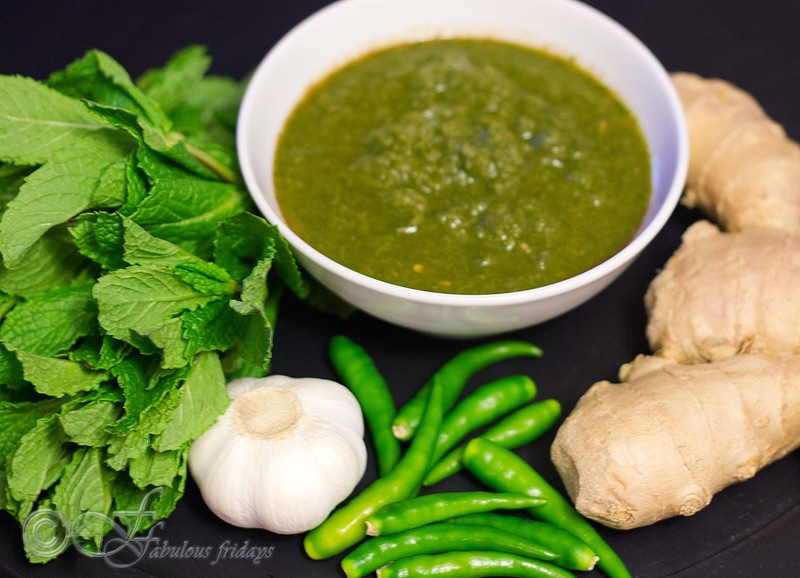 This vegetarian appetizer is a popular Maharashtra street food and is served with a bunch of condiments such as green mint coriander chutney and the red chili garlic chutney. Flavored mashed potatoes are shaped into round balls and dipped in a thick chickpea flour batter, then deep fried to get a crispy exterior with a soft interior. Bonda is usually a thick 2-3 inch sphere, but sometimes I make small, one inch rounds for a party. Serve it as an appetizer with chutneys or pressed in between pav (buns) with the vada pav special chutney as the ultimate Indian burger. 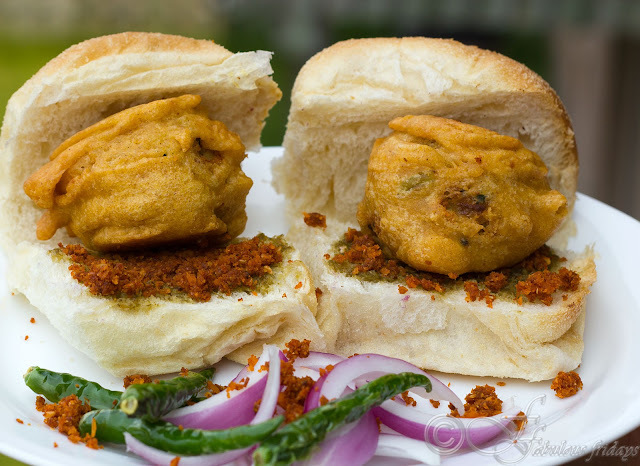 Stay tuned for the vada pav recipe next week. Mash the boiled potatoes roughly. Add green chilies, ginger, salt, pepper, turmeric and amchoor. Make sure the salt is on the lower side since the batter will be salted too. In a pan on medium, heat oil and add hing and mustard seeds. let them crackle for a few seconds before adding curry leaves, garlic and onion. Cook stirring often till onions turn translucent. Add the potato mixture and mix well to distribute the onion and flavored oil evenly. Cook for 3-5 minutes. Take out of the heat and mash them well. Add the coriander and mix well. Cool. When cool enough to handle, divide the mixture into 10-12 portions and shape into 2-3 inch round balls. Keep aside ready to batter. Heat the oil for frying in a deep pan while you prepare the besan batter. Mix all ingredients for the batter together and add water to form a smooth thick (pancake like consistency) batter. Make sure the batter is lump free and remember that the potato already has salt, so season the batter accordingly. Oil should not be smoking, and should be about 350 F, medium high. Check the oil temperature by putting a few drops of batter in it. If they start to sizzle and float to the surface, then the oil is ready for frying. Coat the potato balls evenly and generously with the thick batter and gently slide into the oil. They should completely immerse in oil. Fry on medium heat till golden and crisp on all sides. Remove with a slotted spoon on a paper towel lined plate to eliminate any excess oil. Serve hot with mint chutney and chili garlic chutney. 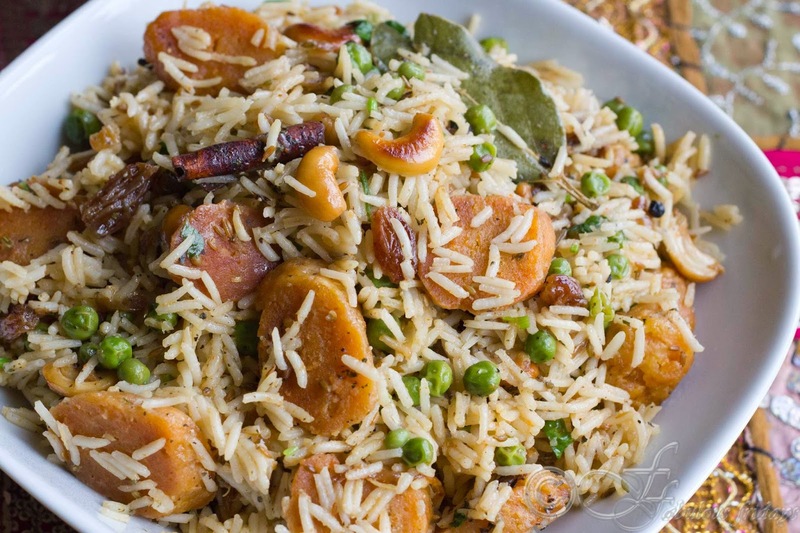 Gatte ka Pulao is a flavorful rice preparation from the Marwadi cuisine. 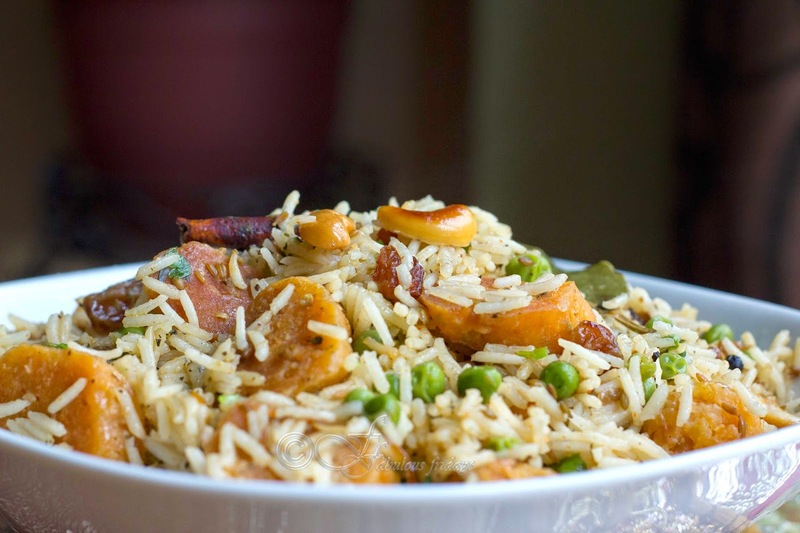 A brilliant dish to prepare when there are no vegetables in the fridge and you are craving a spicy vegetarian pulao. Gattey or gram flour dumplings are boiled & fried and then added to aromatic rice cooked in ghee, spices and green peas. Traditionally no onion is used but I like the taste and color it gives. Omit onions if you want the authentic dish. It is generally served with chutney or curd. Take all the ingredients (except oil and yogurt) for the dumplings in a mixing bowl. Make a well in the center and add oil. Use your fingers to incorporate this all over so that the mixture starts to resemble fine bread crumbs. Now add the yogurt and knead the gram flour into a stiff dough. Roll the dough into several 1 inch thick rolls like a sausage. Meanwhile keep about 3 cups of water to boil in a shallow pan. Gently lower the coils into the boiling water and boil on high for 12-15 minutes. Remove the coils onto a chopping board and reserve the water for the gravy. Slice the coil into even sized 1 inch pieces. Slice them at an angle. In another pan take a few tbsp of oil and on medium heat lightly fry the gattes for about 1-2 minutes. Keep aside. Heat oil in a pan and lightly fry the cashews till golden. Keep aside. In the same pan fry the onions till golden brown. Keep aside. In the same pan, add more oil if needed. Add the bay leaves and coarsely ground dry spices. Saute for 10-15 seconds till you smell a roasted aroma. Add the drained rice and mix to incorporate the flavors of spices into the rice, about 30-40 seconds. Add peas and ginger, raisins, salt and chili powder. Mix and add water. Cook uncovered on high till it comes to a rolling boil. Simmer, cover and cook for 5-7 minutes. The rice should be about 80% cooked by now. 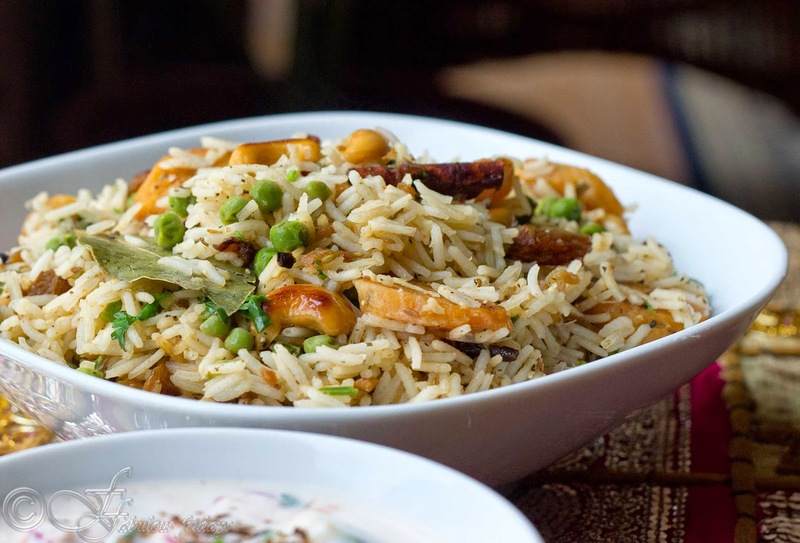 At this point take a deep bottomed pan and make layers of rice, gattey, fried onions, cashews, mint and coriander. Repeat. Cover the pan and cook on very low heat for 5-7 minutes till rice is fully cooked. Let rest for 5 minutes, fluff gently with fork and serve with raita of your choice. 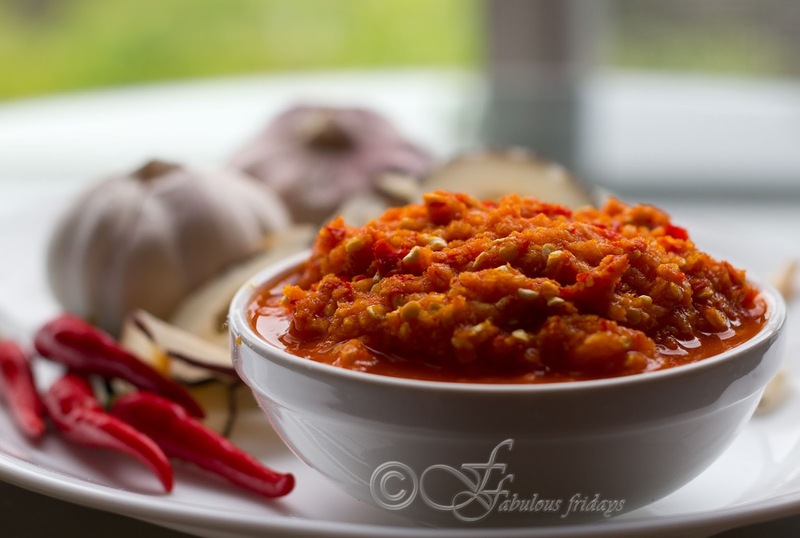 This is an easy recipe for when tomatoes are in abundance in your garden. 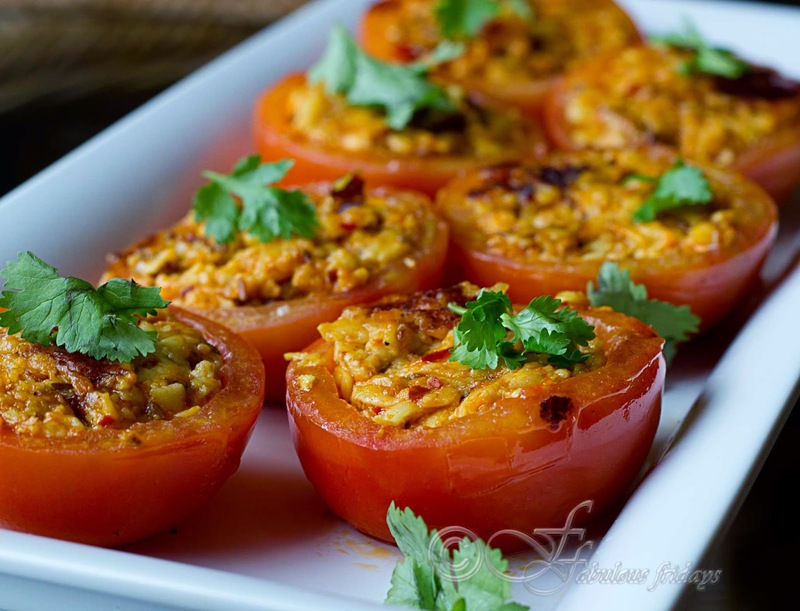 A large platter of paneer(Indian cottage cheese) stuffed tomatoes can add flavor and color to any meal. These zesty and spicy babies can be paired with any grilled fish or meat dish, or serve them as starters. I have filled these with paneer flavored with some very basic spices. You can cook these in the oven or in a non stick pan, either way they cook fast. Cut each tomato neatly into half. Using a spoon, scoop out all the pulp. Puree this pulp and keep aside. Salt the insides of the tomatoes lightly and keep them upside down on a cutting board while you prepare the filling. Chop the onion fine and crumble or grate the paneer. In a pan heat oil and add cumin seeds. Wait for 10 seconds till they roast, then add onion. Fry them stirring often till they turn pink. Now add the ginger garlic paste and cook till raw smell of garlic disappears. Now add the pureed tomato pulp and mix well. Add the crumbled paneer and all the spices. mix well and cook till the mixture leaves oil at the sides. Cool. Spoon the paneer mixture inside the tomato cavity. You can cook these in one of two ways. Spray the outside of the tomatoes with some oil and grill them on high for 10-15 minutes till they are heated through. OR spray a non stick pan with some oil and place the tomatoes gently. Cook with lid on at high heat for 3-5 minutes till heated through. Keep an eye on these and check frequently to ensure they are not burning since you are using high heat in both cases. I do not recommend cooking then on low heat as the will leave a lot of water and loose flavor.